Who needs plot when there are just interesting characters? Much like his wonderful Before trilogy and the masterful Boyhood, this picture doesn’t really have a structure in its narrative. Now, there is an established timeline – the film takes place three days before the start of college, and a countdown to that pops up occasionally – but it feels nonexistent since the character’s interactions and conversations are what drive the film forward as opposed to an end goal. With those, Linklater deftly peels away the layers of these individuals and reveals what makes them them. It’s certainly a magnificent feat, considering that they initially come across as the archetypal frat bros unabashedly putting their machismo on full display, but the longer the camera rests on them, their charm, histories, and the depths of their personalities progressively rise to the surface. 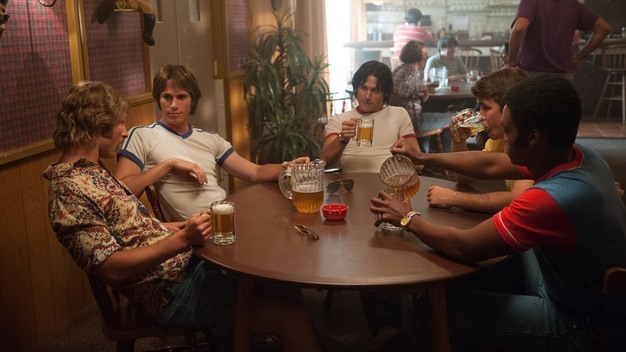 Linklater takes particular interest in their masculinity, and works to not only portray their every attempt to show it off, but also explore where it comes from and why it’s incredibly important – hell, necessary – for each of them. The film does get too on the nose in regards to these ideas towards the end, so it feels as though Linklater is spelling it out for us, which isn’t necessary since he communicates the themes quite clearly before that. There aren’t any big names in this cast, but if the film ever meant to be a showcase for their talents, they knock that opportunity out of the park. Blake Jenner’s Jake Bradford serves as the audience surrogate for this world of baseball, girls, and machismo, so he gets the most screen time, which he utilizes quite well thanks to his charisma. Interacting with him and one another is a strong supporting case, and they prove to share excellent chemistry. 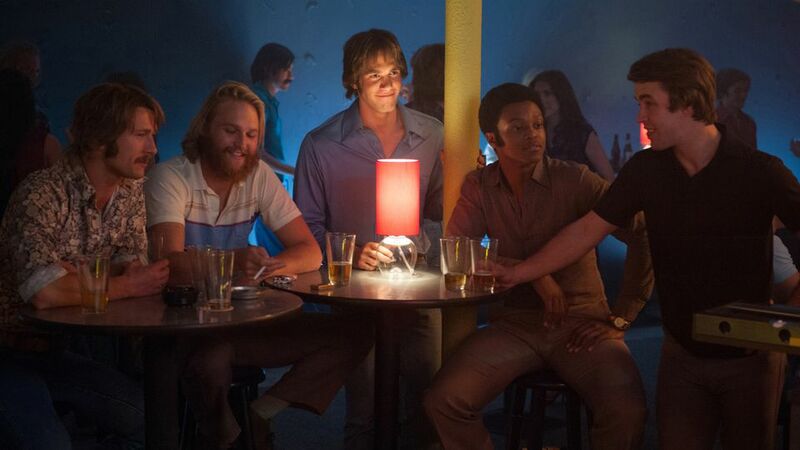 Of them, the standouts are Tyler Hoechlin, Glen Powell, and Wyatt Russell (playing McReynolds, Finnegan, and Willoughby respectively), as each of them bring plenty of charm as well as a dose of gravitas to their roles, and they are exceptional at playing off of their fellow actors and actresses. Special mention also goes to Zoey Deutch, who plays the film’s sole fairly prominent female character. She does take on a more active role almost halfway way through this picture, but when she comes in, she not only provides a welcome break from the guys, but also grounds Jake by reminding us just where these students are from and what they seek from college. That may be much to ask from Deutch, but she handles it all with ease. The film is certainly in the same spiritual vein as Linklater’s other works, but it’s fascinating how it seems to stand alone stylistically. The filmmaker’s love for music is ever-present here, as an eclectic soundtrack – consisting of ’80s songs from artists like Van Halen, The Cars, and The Knack – plays a significant role in getting the audience to settle into the characters’ world and even springs the characters themselves into certain enjoyable actions. Surprisingly, the director’s penchants for extended takes and long stretches of dialogue aren’t prominent here as one would expect, and longtime Linklater’s longtime film editor Sandra Adair has plenty to juggle here, cross-cutting frequently. 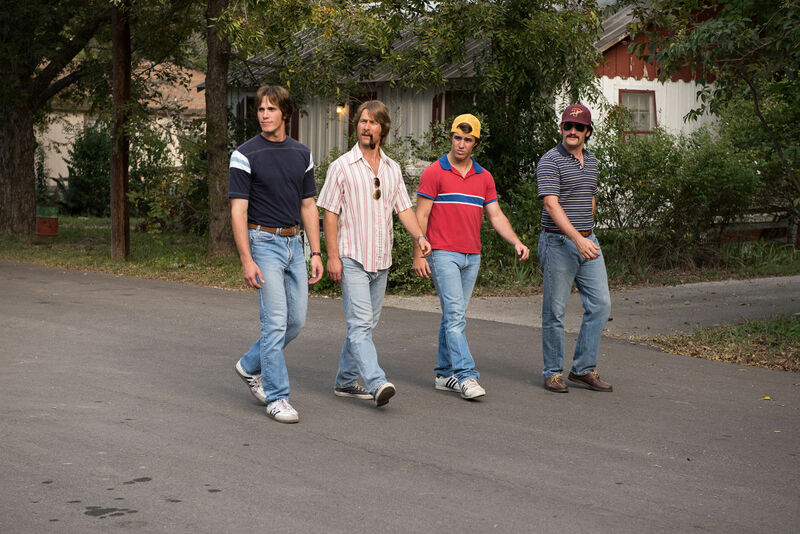 The camera itself seems much more involved too, as Linklater opts for several “dramatic” shots to build anticipation, like when the film captures Jake’s first walk up to the guys’ baseball house in a dolly shot. Really, what more can be said? Everybody Wants Some!! may not be Linklater’s best work, but it’s a delightful, irresistible picture that confidently builds and draws from its characters, and also acts as a reminder of how seemingly meaningless conversations and interactions can reveal so much about people.